This is for Anyone for Anya's Movie and Simon Says Anything Goes challenges. I decided to make a card inspired by the musical Newsies made in the 1990's with a very young Christian Bale. Here is my daughter's entry for the TGF's Little Sprouts challenge. Maggie is 12 years old and loves nerdy science stuff. One of her favorite shows is The Big Bang Theory and she made a SMASH page using pics online, some doodles, and made her own Sheldon, Penny and Leonard using TGF's Later Skater Ian, Miss Anya Lounge, and Special Autumn Ian. They are colored in colored pencil and Leonard's glasses are drawn in with a multiliner. So the fabulous ladies at The Greeting Farm have cooked up a little fun for our creative kiddos out in blogland. TGF is inviting Little Sprouts to show their TGF creations in two catagories - those 9 and under and those 10 and up. My kids love to make things and have gotten into SMASHbooks as much as I have. Both of my older two children were all over this as soon as I showed them the challenge. First, I have Alex's creation. Alex is 9 years old and decided to SMASH his hobbies featuring TGF's Karate Ian, Cute Troop Ian, and Soccer Ian. He colored them with colored pencils and used some stickers I had laying around, as well as doodling, to complete his page. This is for Simon Says emboss it and TGF's Farm Fresh Friday recipe challenge. The recipe includes the following: 1) must have a boy, 2) birthday themed, 3) use turquoise, orange, and silver. This is for TGF FFF Brights and Mojo Monday #258 challenges. I know it's not the brightest colors, but the patterns are cheery, so why not? The directions for the mini magazine holder was found here. The holder is made from Old Olive with layers of Blushing Bride and retired SU Pawsitively Prints. This is for Mojo Monday #257 and Pixie Dust Studio's Boo challenges. 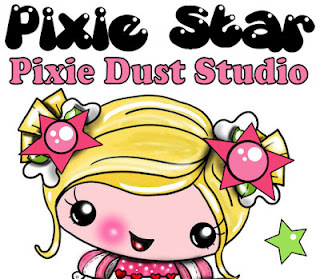 This is for Pixie Dust Studio Halloween challenge. This is for TGF's FFF White Out and Simon Says Put a Stamp on It, and Deconstructed Sketch #67 challenges. Like all parents, I am doing the happy dance cuz my kids are all officially in school...even the baby of our family! This card is for Pixie Dust Studios Back to School challenge. I just love baseball! I don't seek out the games, but if I stumble on my favorite team playing, I'll watch. I also love baseball movies...from Eight Men Out to A League of Their Own to The Sandlot, I love them all. 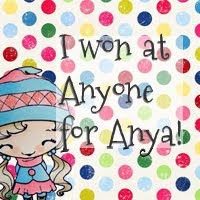 This is for Anyone for Anya's "Anything but a card" challenge.